North Carolina Collection of the Pack Memorial Library. On February 1, 1889, the first streetcar in North Carolina made its debut in Asheville. The first line extended from Pack Square down Biltmore Avenue and Southside Avenue, and then was routed west of present-day McDowell Street to a train depot. The system’s roots can be traced to the previous year, when the city authorized a charter for an electric railway that would include lines from Pack Square to various sections of the city. E.D. 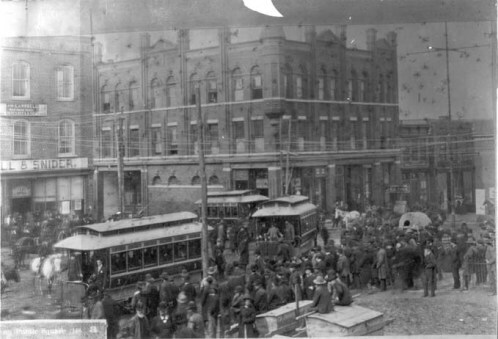 Davidson, who had designed a Canadian horsecar railway, agreed to build the system in collaboration with Frank Sprague, who engineered the streetcar system in Richmond. After the initial launch, a number of railway companies organized and built streetcar lines to emerging neighborhoods and outlying areas, including the Sulphur Springs resort and Biltmore Village. By 1907, Asheville led the state in streetcar traffic, carrying 3 million passengers annually, compared to Charlotte and Wilmington with 2 million each. By 1915, the streetcar railway reached its peak, operating 43 cars on 18 miles of track, including one to the newly opened Grove Park Inn and the surrounding upscale neighborhood. The system ceased operation in 1934 when it was supplanted by buses. Visit: The N.C. Transportation Museum in Spencer features a variety of exhibits on North Carolina rail history.